A little more history: I got the word early in 1975 about a video game chip being developed by two engineers at General Instruments’ labs in Scotland -another "unofficial" skunk works project there. Ed Saks, the General Manager of G.I. in Hicksville, Long Island, New York heard about that single-chip video game device and moved the two Scottish engineers from Glenrothes to Hicksville. I got an early demonstration of the game chip. It was impressive. It played multiple games and required very few external parts to make it into a complete TV game. Within a couple of years, that chip and its successors would be designed into millions of game units manufactured all over the world. It occurred to me that Coleco should know about this chip. I had previously met Arnold Greenberg, Coleco’s president at Marvin Glass & Associates in Chicago. We had lunch together in MGA’s small dining room with its Chagall windows reproductions looking down on us. Marvin Glass & Associates were the pre-eminent toy & game designers in the US at that time, whose outside electronics capability I had become. Arnold was there to look at new products. I called him and some time later Arnold met me at GI’s Hicksville, LI, NY plant where the AY-3-8500 single-chip, multi-game device was demonstrated to us by Ed Saks. Ed ran the plant and later moved GI’s IC manufacturing to Phoenix, Arizona (it’s now Microcircuits). Thus Coleco became GI’s first and preferred customer for the AY-3-8500 chip around which, as I said, millions of off-shore (HK, Taiwan, etc) games were built (on all of which Sanders/Magnavox collected royalties, by the way). Thus was born "Telstar". Text written by Ralph Baer. Courtesy of David WINTER. 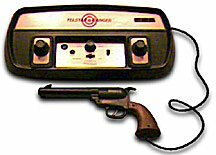 "Telstar", Coleco's first video game system, was released in 1976 and played only three games with three difficulty levels. It was the first system to use GI's AY-3-8500 chip and was a real success: over a million units were sold. 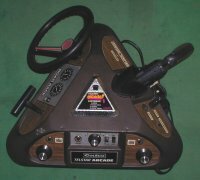 There were even two variants: one sold by Coleco in Canada as "Telstar Deluxe", and another (same) sold by Montgomery-Ward under the name of "Telstar Video World Of Sports". The AY-3-8500 chip played six games with more difficulty levels, and the games could also be played in color. It was pretty obvious that Coleco would release more systems: at least 15 different games were released in two years. All were similar and based on the same GI chip except a few models like Telstar Galaxy, Telstar Combat, Telstar Gemini (which used a MOSTEK chip) and Telstar Arcade (which used MOSTEK chips in plugin cartridges). The only differences between the Coleco "Ball and Paddle" systems were the number of games, the way the difficulty levels were used, and the type of picture (color or black and white). An amazing detail is the way Coleco packed their video game systems: they were sold parially assembled. The systems were electronically ready to play, but the users had to put the knobs and stick the decorative stickers on the plastic case. So far, only Coleco is known to have released their systems this way. It is believed that this was done to save on assembling costs. To learn more about Coleco Telstar systems, click on their photo.